My head hurts! While I slept last night a 14,325 pound African Elephant crawled through my ear. This morning he's being chased by a lion with his enormous feet pounding as he runs. Oh wait, Horton just stopped at a river. What's he doing? Spraying water from his trunk right behind my pupils making my eyes run like a faucet. My teeth feel like they were a stage for his Riverdance audition! Is it a migraine? If it's not, it's real close. According to WebMD, migraine symptoms include a pounding headache, nausea, vomiting, and light sensitivity. They can also include visual disturbances referred to as auras. It is estimated some 45 million people suffer from this type of headache. I have been diagnosed with a migraine including all the symptoms and visual problems. A migraine headache is quite disturbing. How to get rid of a migraine quickly is a hot topic for good reason. 1. Tap away a migraine with EFT. My daughter uses this. I've seen it work very effectively and quickly. 2. Take Feverfew at the first sign of headache. Feverfew can also be taken every day to help prevent migraine attacks. I've personally used this and it works! Please use my referral code 2926490 if you decide to purchase from Nature's Sunshine via the link. Stock up and keep them on-hand. 3. From my daughter's facebook page. She's not put this remedy to the test but I'm impressed she shared it. 4. Do reflexology on your feet to relieve a migraine. I L.O.V.E reflexology because it works wonders for many illnesses/disorders. Easy to do on yourself and FREE! 5. Nutritionists and doctors are taking note of our diets more these days and so should we! I get House Calls from Dr. Hyman (not real ones). I subscribe. You can too! 5 Steps to Solve Your Migraines was especially interesting. There's many more suggestions other than just diet changes in this article. However, I know diet changes reverse or stop many ill health effects. 5 Tips for Problem Eyes is my personal journey of how diet changes can improve your appearance. I am not a health professional. These statements have not been evaluated by the FDA. They have been evaluated by people like me and you who have migraines and found them to be effective. No prescription required. Minimal out of pocket expense! I hope you find something in this post that works for you. If you have a quick-fix migraine remedy that you use, please leave me a comment. Sharing your experience may help someone else. I have suffered with migraines since I was 9 I'm 12 going on 13 and I have 1-3 migraines a year I will sure try these techniques. Hi Chloe! Sorry to hear about your migraines. They hurt! I have them sometimes but my daughter has them pretty regularly. I sure hope one of these techniques work for you! My daughter likes the tapping method best. Let me know how if it works for you. 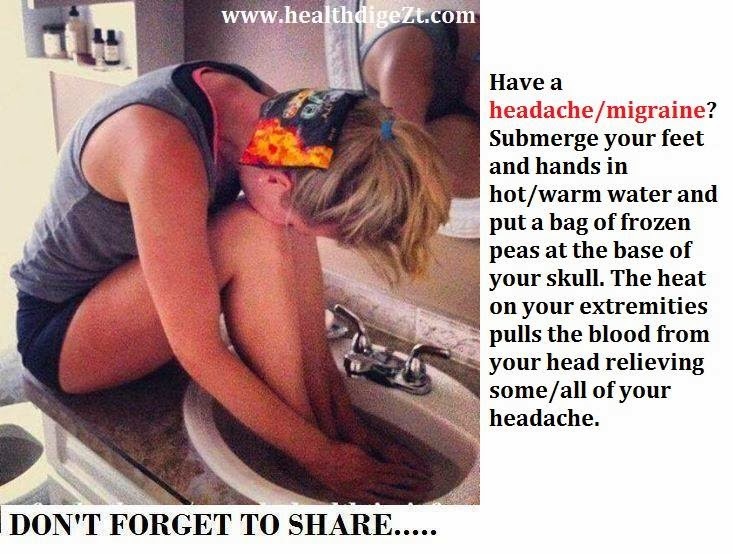 These tips are actually very useful, especially for those who encounter headaches often. But of course, it’s still best to consult a professional when it comes to those constant headaches. Because it might be a symptom of a far worse problem. Anyway, thanks for sharing this post with us, Tammy. All the best!